The self-proclaimed Islamic State (IS) has wrestled control of five villages in Syria’s northern Aleppo province from rebel groups, bringing it closer to the Turkish border and an area from which Ankara and Washington are planning to launch a "comprehensive" attack against the group. According to UK-based monitoring group, the Syrian Observatory for Human Rights, intense fighting between the ultra-radical terror group and Syrian rebels began overnight and continued on Thursday morning. IS militants captured three villages near the strategic town of Marea, roughly 12 miles from the Turkish border, and entered its outskirts, AFP reported, citing the Observatory. Further north in Aleppo, the terror group also captured two more villages which were previously under the control of the al-Qaeda Syrian affiliate, al-Nusra Front. According to Observatory estimates, two dozen fighters have been killed on each side, though no specific toll was given. The monitor group also reported that an IS car bomb exploded in the southern outskirts of Marea Thursday morning. 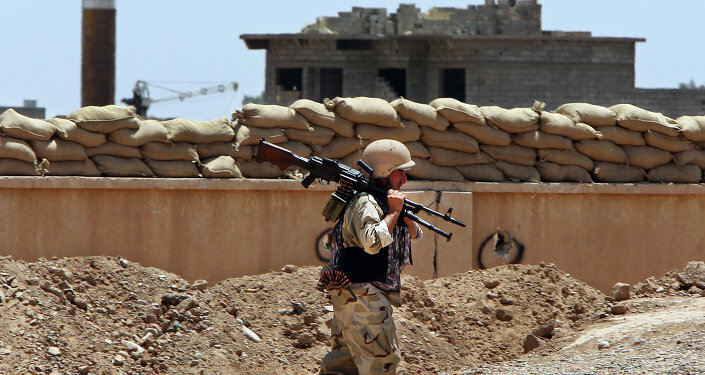 Syrian rebels battling the IS are struggling to keep Marea from the terror group’s reach. The town, which lies on a supply route running directly to the Turkish border, has been targeted by IS fighters for months. "If [IS’s] progress continues, the northern countryside of Aleppo could fall," a rebel told Reuters. "If Marea falls, it means the fall of an important symbol of the groups fighting Daesh," he added, using the Arabic acronym for the terror group. Recent reports from activists and medical groups in the area indicate that the IS has been using chemical weapons, including mustard gas, on civilians in the area. According to Reuters, the medical charity Medecins Sans Frontier said it had recently treated patients who have been exposed to chemical agents. Doctors in the area told the Guardian that patients from Marea suffered from skin lesions, respiratory problems and redness in the eyes after attacks from last week. The recent advances come shortly after Washington and Ankara agreed to cooperate on a new offensive to create an IS-zone. The offensive would see the United States and Turkey providing aerial cover for rebel groups on the ground, which Washington has deemed ‘moderate,’ to push the terrorists out of a rectangular area along the border territory. The plan is supported by most rebel groups in Syria, including the Islamist Ahrar al-Sham, which Washington does not cooperate with. However, the al-Qaeda linked al-Nusra Front has rejected the plan, despite their opposition to the IS. The group subsequently withdrew from the area it controlled near the border and turned it over to other rebels to avoid cooperating with Ankara and Washington’s plans. The plan to set up an IS-free zone along the Turkish border has been described as a potential game changer in the conflict, as the border is known to be used by the terror group to bring in foreign fighters and smuggle supplies.